This book helps novice users with the basic operation of Companyweb, specifically on Microsoft Windows Small Business Server 2011 Standard as it represents the latest version of the software. If you are using Windows Small Business Server 2003, 2003 R2 or 2008 you will also find Companyweb but much has changed since those previous versions, however there are still some similarities. As such, this document may still provide some insight into the basics of older versions of Companyweb. It will show you how to start interacting with Companyweb so it can be put to use in your business. 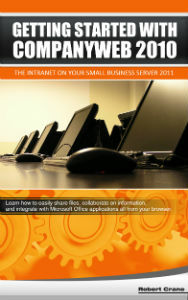 This booked is aimed at users who have never used SharePoint (Companyweb) on Windows Small Business Server 2011.